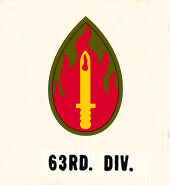 Three regiments of the 63d Infantry Division arrived in Marseille, France, 8 December 1944, trained at Haguenau and, under the designation Task Force Harris, protected the east flank of the Seventh Army along the Rhine River. The Task Force fought defensively from 22 to 31 December 1944. The rest of the Division arrived at Marseilles, 14 January, 1945, and moved to Willerwald, 2 February, where it was joined by the advance elements on 6 February. On the 7th, the 63d conducted local raids and patrols, then pushed forward, crossing the Saar River, 17 February, and mopping up the enemy in Muhlen Woods. After bitter fighting at Gudingen early in March, the Division smashed at the Siegfried Line, 15 March, taking Ormesheim and finally breaching the line at St. Ingbert and Hassel, 20 March. Before resting on the 23d, the 63d took Spiesen, Neunkirchen and Erbach. On 28 March, the Division crossed the Rhine at Neuschloss, moved to Viernheim and captured Heidelberg on the 30th. Continuing the advance, the 63d crossed the Neckar River near Mosbach and the Jagst River. Heavy resistance slowed the attack on Adelsheim, Mockmuhl, and Bad Wimpfen. The Division switched to the southeast, capturing Lampoldshausen and clearing the Hardthauser Woods, 7 April. A bridgehead was secured over the Kocher River near Weissbach, 8 April, and Schwabisch Hall fell, 17 April. Advance elements crossed the Rems River and rused to the Danube. That river was crossed on the 25th and Leipheim fell before the Division was withdrawn from the line, 28 April, and assigned security duty from the Rhine to Darmstadt and Wursburg on a line to Stuttgart and Speyer. The 63d began leaving for home 21 August.